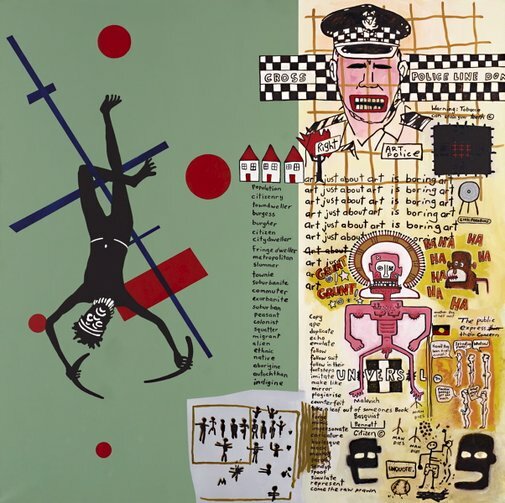 Gordon Bennett's paintings in the late 1980s and early 90s were informed by theories about appropriation - the borrowing of images from other artists and visual sources - and by post-colonial theories about identity and history. Appropriation allowed Bennett to refer to both Aboriginal and non-Aboriginal art, and situate his painting in a fluid area between these two overlapping forms of contemporary art. This painting emanates from the 'Notes to Basquiat' series of paintings, where the artist takes appropriation to a new level within his practice. Bennett not only borrows images from the work of American artist Jean-Michel Basquiat, but also begins to mimic Basquiat's spontaneous and gestural urban style of painting, reflecting his involvement in the graffiti culture of the United States. This citation of Basquiat's work acts for Bennett as a mode of communication with the American artist who died in 1988. This conversation is manifest quite literally when Bennett drafts a letter to the - then already deceased - Basquiat, outlining his reasons for emulating his style. Underlying this dialogue with Basquiat Bennett's need to re-contextualise the issues that he has explored throughout his artistic career, confronting them within a global context. Signed and dated u.l. verso on canvas, pencil "G Bennett 31-8-1999/ …". Khaled Sabsabi, Look , 'The art that made me', pg. 23-25, Sydney, May 2017-Jun 2017, 24 (colour illus.). Bérénice Geoffroy Schneiter, Le Journal des Arts , 'Art premier: La création aborigène repensée', pg. 11, Paris, Nov 2013-Dec 2013, 11 (colour illus.). Look , 'The art that made me: Reg Mombassa', Sydney, Nov 2015, 13. Biennale of Sydney 2000 , Sydney, 2000, 39 (colour illus. ), 210. Outsider/insider: the art of Gordon Bennett , Ghent, 2012, 50 (colour illus.). Mémoires vives: une histoire de l'art aborigine , Bordeaux, 2013, 220, 221 (colour illus. ).